Let’s see if I can come up with a post every day of the rest of the offseason. Today, there are 41 days left until Opening Day on April 6. This...was not one of Escobar's team-leading 8 triples. is the number of triples Royals players hit in 2011. 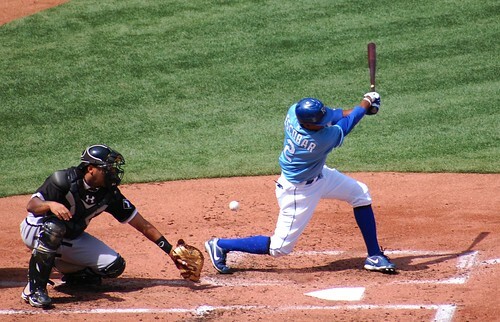 Alcides Escobar led with 8, followed by Melky Cabrera with 5. Alex Gordon, Jeff Francoeur, and Johnny Giavotella each hit 4. Eric Hosmer, Chris Getz, MITCH Maier, and Mike Aviles had 3. Sal Perez added two, and Wilson Betemit and Mike Moustakas each had one. The team total was actually second-best in the Majors, and tops in the American League. Three of the Royals who hit them last year are gone, but four guys on that list above only played part of the season for the Royals. Does this mean KC will be tops in the league in triples again? Who knows? They did in 2009, with 51. But 41 is all it took to lead the league in 2011. Part of what makes triples so exciting, I think, is how random they are. All kinds of hitters can lead their teams in triples. It’s just as likely to be a scrappy little infielder who bounces a lot of hits right into the corners as it is to be a power hitter who pounds the gaps consistently. Triples require almost as much dumb luck (or dumb outfield reaction) as they do athleticism.